The conditions were close to extreme. Wind gusts over 35 Knots. 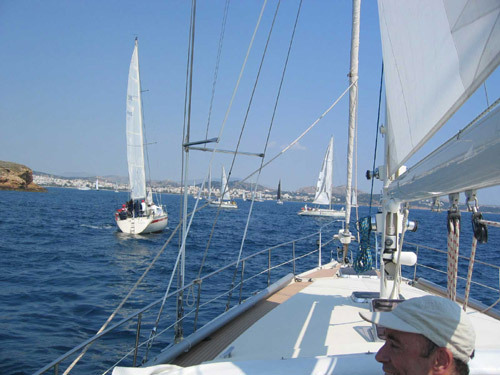 South wind which in Saronicos creates big waves and very uncomfortable seas. Yes…… the perfect conditions for “Alma Libre” We had a lot of fun during the race especially in the night. They say that there is beginner’s luck and it sure is. 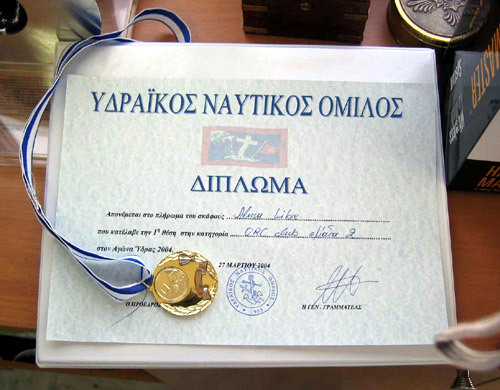 We won the first price and the photo is the proof of it. Just for the people that do not believe that the Super Maramu is not a racing boat. The wind conditions were not favorable for our boat. We started last but we were able to recover as you can see from the picture the lost ground. However later we had a rain storm and no wind. We had to abandon the race on both legs . 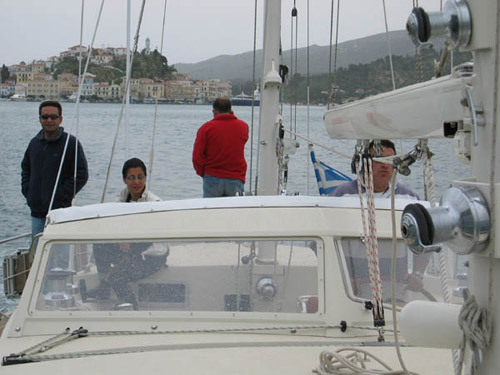 But we had a nice time onboard and in the harbor of Merichas. This is the most favorite race of all with over 100 boats participating. The wind conditions were once again not favorable ( no wind) for our boat on the first leg of the race from Voula to Kea. We started good but we were not able to continue as the wind dropped to below 5 Knots . However later after dark we had some wind and we were able to sail in the night after Makronisos to Vourkari the yacht harbor of Kea. We had to abandon the race. But we had a nice time onboard and in the harbor . 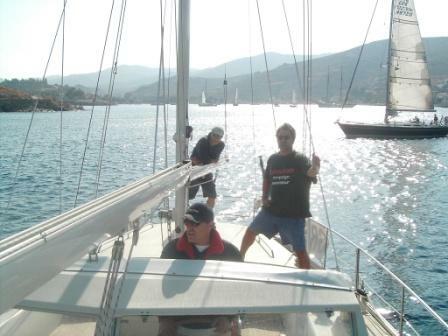 On Sunday May 23 we started for the race back to Voula. 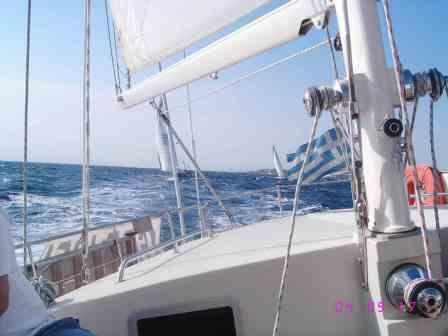 The wind was around 15 Knots coming from the south so we had to make some tacks to sail past Makronissos. We managed to finish the race although the wind has dropped as we neared the finish line. Everybody onboard was happy that we finally made it. It was hot and sunny. Perhaps the first nice week-end after the long winter. This is the fall race with over 50 boats participating. Due to the Paralympic games the starting line has been moved again to Voula as otherwise the racing boats were going to sail in non permitted areas in Saronicos. But the wind conditions were totally different this time. Strong north winds were forecasted. In Saronicos the conditions were very favorable for Alma Libre and we were able to pass many boats aw you can also in the picture below. 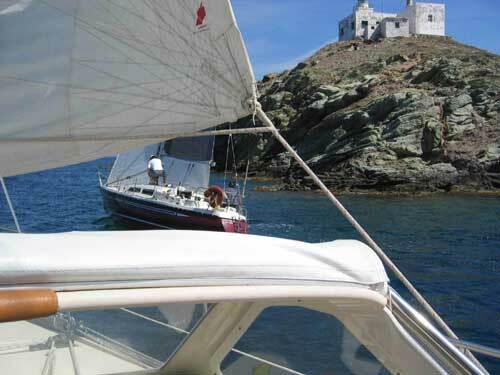 Later after passing cape Sounion we found very strong north wind with over 35 Knots gusts and we were able to sail very fast in the night after Makronisos to Vourkari. What a surprise we were there together with all the fast racing boats we were the sixth boat in the harbor after a hard race. Next day we saw the results : we had reached the second position after the handicap. We were very happy after our fight with the sea and the wind. On the way back Sunday morning the wind had drop as on Saturday the wind was force 8 . We started with east wind and near Makronisos the wind was again 30 Knots from the north so we had a fantastic sail with over 10 Knots speed until we arrived near Voula and the wind dropped to zero and we decided to abandon the race. But we had as always a nice time onboard and in the harbor. Last revised by: on September 26, 2011.